Mr. Earl Redrick addresses the Student Body. 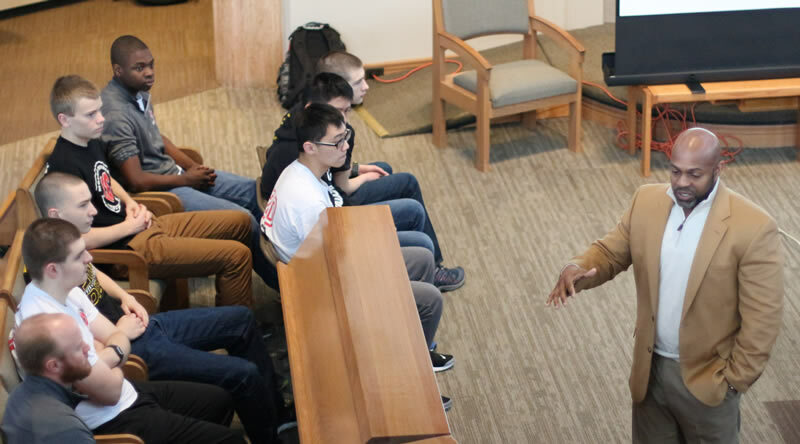 Originally scheduled for Martin Luther King Day but postponed due to weather, this year’s Diversity Day coincided with Ash Wednesday. Bro. August Schaefer OSB pointed out the appropriateness of this alliance in that just as Lent is a time for looking back and reflecting on how we can grow and improve, this also is the point of Diversity Day. Earl Redrick served as keynote speaker. Mr. Redrick is the Director of the Omaha Field Office of the U.S. Department of Housing and Urban Development, an adjunct instructor and social equity & anti-bias facilitator. Mr. Redrick has a Master of Business Administration and is a 21-year retired veteran who served in numerous tours and deployments. His 50-minute address, "Inclusive Leadership for the Next Generation of Leaders,” focused on diversity, inclusion, and the many obstacles throughout history that hindered the ability of many Americans to reach acceptance and success. After Mr. Redrick’s presentation, students and staff broke up into groups for various activities and discussions related to diversity, including a video about Martin Luther King, Jr.’s march from Selma to Montgomery, Alabama.